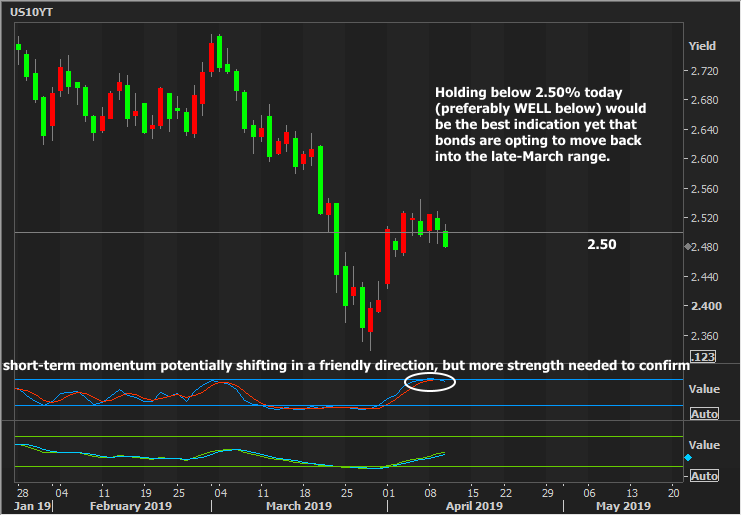 Wednesday is off to a good start with friendly inflation data leading things off at 8:30am and an even friendlier press conference from European Central Bank (ECB) president Mario Draghi. The ECB didn't make any policy changes, but Draghi's tone hasn't changed from the last meeting. He reiterated a generally gloomy stance with lower growth and inflation ahead. Notably, he said that inflation should bottom out in September and that growth headwinds were temporary, but what else are you going to say if you're the 2nd most important central banker in the world? "Hey guys... we're screwed and nothing we can do is going to prevent recession?" In other words, Draghi has been and continues to be about as gloomy as any central banker could be. Any more pessimistic and he'd risk causing panic (gloom/pessimism = good for bonds). I'd argue that much of the European bond rally in response to these comments and similar comments in the past has benefited from at least a modicum of panic over his choice of words. 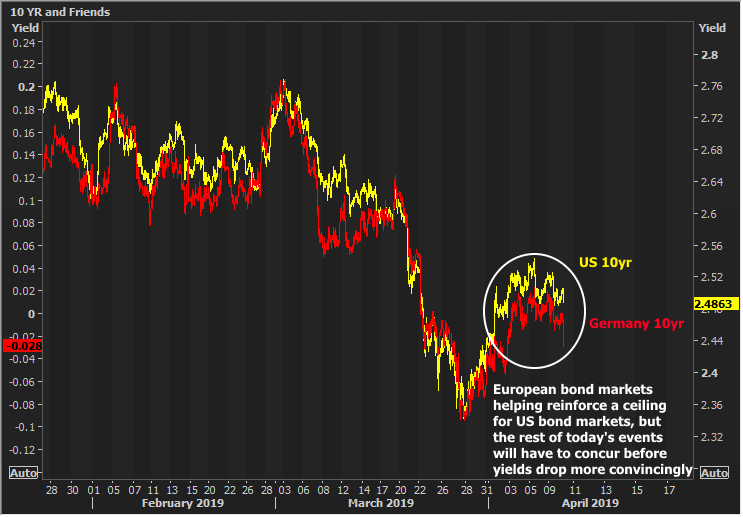 The bigger rally in European bonds is spilling over to US markets and helping 10yr yields hold an important ceiling so far this morning. But we'll need to hear from our own central bank before getting too excited. While we won't get the same top-tier event (i.e. today is not a Fed policy statement and there is no press conference), today's Fed Minutes will offer a more detailed account of the meeting that took place on March 19-20. That's the meeting that resulted in the surprisingly bond-friendly Fed announcement and the decision to stop the balance sheet runoff (half of it in May and the other half by October). In addition to the Fed, the 1pm 10yr Treasury auction could also offer a fine-tuning adjustment to the day's overall momentum, but the reaction could be limited due to timing (auction at 1pm, but investors will be curious to see the Fed minutes at 2pm). Finally, there are potential Brexit headlines although it's impossible to pin down the timing. The emergency EU summit to decide the fate of Brexit has already begun, but so far, comments are only referencing "tonight" in terms of time frames. That's anywhere from 1-6pm ET, depending upon one's definition of "tonight."